Usually there is no Berlin Film festival for me without attending some films from the children-, and youth section. Here film and festival still belong together and and in recent years some of the films selected for this section were still with me at the end of the year. Sekala Niskala, the second film by Indonesian filmmaker Mrs. Kamila Andini could be one of those films. It´s narrative style seems rather rising from a given situation than from a conventional story. Two twin children (the girl Tantri and the boy Tantra)somewhere in Indonesia: their amusement is to steal sacrificial offerings like eggs. For now it is a bit like in Hou Hsiao Hsien´s early films. This specific childlike living from day to day suddenly stops when the boy gets seriously ill. A new and rather dramatic situation develops where the episodic narration will be built on. But Andini avoids any dramatization and like the old Japanese masters the feelings the film will evoke by the sum of experiences and not through preformed dramatic effects. For a long time, the film is made of long static shots or shots where the camera movement is almost invisible. Sometimes the camera, especially in open air shots will move occasionally. The single episodes the film´s narration is based of are not just summing up to a story but offers options for a story. Beside a certain formal stringency, the film introduces another element, a playfulness. Dance performances by masked children with painted skin convert the prosaic aspect of the films for moments into dreamlike sequences. The film develops a dynamic between realism and dream between static and movement. The hospital scenes follow the sober aspect of the first scenes. The whole family camps in the reception room to be with the sick boy. A small dialog between the parents suggest that the boy´s illness is very serious and they have to expect the worst. There is for example one shot typical for the more prosaic aspect of the film but which gives through this very shot a subtle hint to feelings: The girl is in the left part of this frame, just on the edge of the frame while the sick boy on the opposite site, almost hidden by the curtains of his sickbed. The space between them accented through the mighty CinemaScope format. The more the film develops, the more the foreshadow of inevitability dominates the mood of this film, the more the girl´s dance performances with masks based on animals appear. The initial situation of the film changes with rather surreal moments. 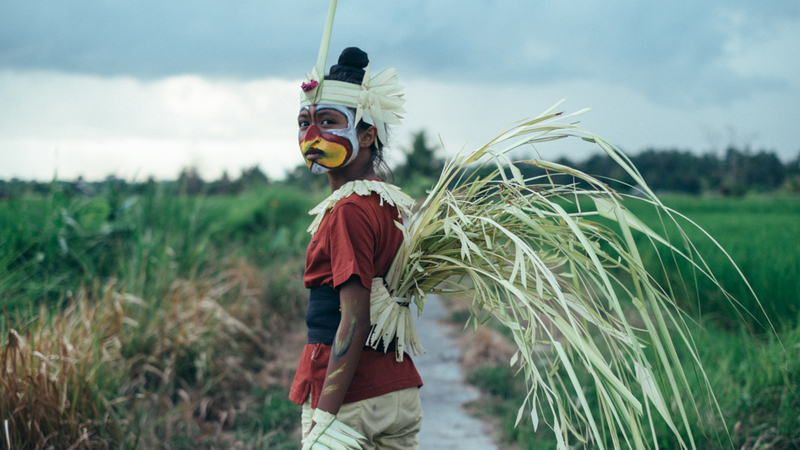 Sekala Niskala is a wise film about aspects of life we can understand and aspects we are defenseless exposed to. The narration seems to move by itself without being forced. There are some very impressive night scenes, a greyish darkness in which the world as displayed in this film is always threatened to disappear in this formless dark grey. It is a strong visual impression for a film which also deals with grieve, loss and fear from the perspective of a child. Sometimes we hear the mother singing. Her songs have something of a elegy to an inevitable loss. It is like a sad rebellion against death, literally against the fading of the light. The paradox of cinema that even the the cultures most alien to me can become very close for a moment. As much as I am aware of the strangeness of this images from a culture far away from me, as much cinema always breaks always universal paths for me. I have no idea when or if I will see this film again in my country, if it enters distribution or not. That is a reason more that to see films like Sekala Niskala seem rather as a fleeting privilege. About one thing I am very sure. Kamila Andini things and feels cinema, she experiments with the core of cinema itself. And even more important, a film like Sekala Niskala from a country which hardly appears at big festivals makes me believe in a future of cinema. At the end I remember a beautiful short moment, a shadow play performed in one of these dreamlike sequences by the sick boy. A fleeting moment but a quite exact analogy to the scope of this film, which reminds me in one moment in Hou Hsiao Hsien and in the next in the amazing silhouette films by legendary German filmmaker Lotte Reiniger.